After a long (beautiful) drive across from Johannesburg, we're back in the field at last. It's been a slightly tempestuous start to the season unfortunately with some ups and some downs. Just as we got to Windhoek we heard that our main sponsor for the season had just pulled out of funding our project at the very last minute (as well as a few others from the same funding round). This is obviously a major concern for the long term future of this project as this money represented core funding for us for the next 2 years. Luckily the Namibia Nature Foundation are fighting our corner (thanks to Rachel Malone on this) and the issue is not yet finally resolved so we are hopeful that the funders will see the light and support our research here. On a positive note - we got off to a flying start here. 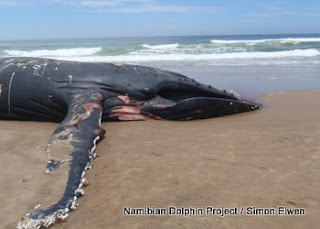 A humpback whale live stranded just last week (while we were en route from JHB!) 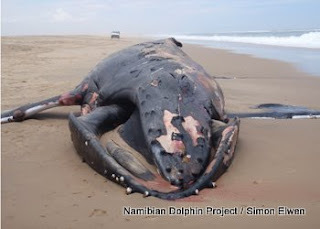 but unfortunately died ~36 hours later despite valiant rescue efforts by many people here in Walvis Bay. We drove down to the whale on Saturday afternoon and took a few measurements and samples and today Naude Dreyer of Mola Mola tours collected some baleen which had fallen out subsequent to our visit. This season, Tess Gridley a PhD student from the University of St Andrews in Scotland is helping me out in the field for a few weeks while collecting some data for her PhD work. Tess is working with Vincent Janik at St Andrews and doing a comparative study of the signature whistles of bottlenose dolphins in different environments around the world (photo of Tess in her 'hole' listening to her dolphin recordings). 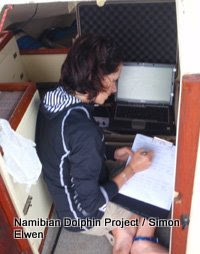 We hope she'll get enough data from the bottlenose dolphins here to be able to include this site in her study. So far so good - we encountered a single dolphin off Pelican Point on Monday and he was surprisingly vocal for a single animal and we got some good behavioural data from him as well. This is a component of the project we're trying to build on from our pilot study - looking at how the dolphins use the bay, e.g. if there are some areas that are used primarily for feeding or resting. Heaviside's are unfortunately rare on the ground at the moment, this may be related to the very warm sea conditions here at the moment (19-22C!) related to the weaker summer winds in the northern Benguela. I can't tell you how lovely it is to have t-shirt weather at sea again after freezing all winter! We did encounter several animals while running north toward Swakopmund this morning including a very small calf, but they were all fairly evasive and very difficult to photograph. This highlight of today was a very small (~8m, smaller than the boat at least) solitary humpback whale. 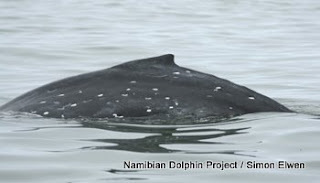 This is the smallest humpback whale I've ever seen alone and thought it might be an abandoned calf, although the high number of well healed cookie cutter shark bites on him suggest he may be older than I thought. We'll continue for the next few days and hope this funding issue clears up in a positive way and we can progress with the project at full speed. There is so much to do here that I really hope we can maintain this project long term. Please let me know if you can think of anyway to help out at all.